Sensory diet is one of the strangest terms in the field of special education. Over the years, I have learned that incorporating a sensory diet into my students’ daily schedules is essential. I bite my nails when I am anxious and pace when taking a business call. I do these things to regulate my mind and my body. However, people with sensory processing issues cannot cope with their environments. By providing children with a sensory diet, we are helping them to regulate their bodies in our chaotic world. A sensory diet is a list a carefully planned activities completed at regular increments throughout a child’s day. The activities are individualized to meet the specific needs of each child so that he can stay organized and focused. Each activity provides a certain type of sensory input so the sensory diet varies from child to child and from day to day. To understand how a sensory diet is used, we must first fully understand the sensory systems. We grew up learning our five senses: sight, sound, touch, sound, taste. But two more sensory systems also exist: the proprioceptive (body position) and vestibular (movement) sensory systems. All of these sensory systems must process input from the environment. Examples of environmental input include loud music, flickering lights, or itchy clothing. While the average person processes loud music and can adapt to it, a person with a sensory processing issue can become extremely agitated with loud music or a flickering light. Children with sensory processing disorders process sensory input on a continuum. Each child additionally craves or detests input from different sensory systems. 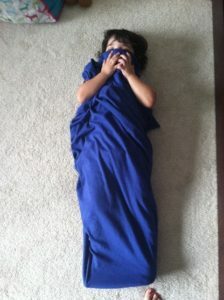 For example, one child might crave touch and want to be wrapped in a blanket. Another child might detest touch and might need to work on desensitizing their aversion by experiencing touch in small increments. It is important to identify whether your child has a need for more or less input as well as which sensory system is most affected. Consult with a professional or contact us at Above All Therapy to design a sensory diet for your child. Click here to get more ideas of sensory activities that you can do with your child.